As some of you may remember, we have a fig tree that we planted as part of our Wedding Ceremony. So I’m always on the look out for great ways to use figs. This jam was not only fairly easy to make, it immediately reminded me of the Christmas holidays. The smells and tastes from the spices combined with the orange and fig were just heavenly. This will definitely be a go-to recipe when making gifts for the holidays! This recipe makes three 8-ounce jars (or you can do a combination of 8 ounce and 4 ounce jars as seen above). Using a fine grater, remove 1 Tbs orange rind and set aside. Peel oranges and remove all pith, seeds, and membranes. Chop the fruit into small pieces. In a large dutch oven, or heavy bottomed pot, combine orange rind, oranges, figs, and sugar. Let stand for 1 hour. Bring mixture to a boil over high heat, stirring constantly to dissolve sugar. Stir in honey and add cinnamon, cloves, and star anise. (The star anise will be fished out later in the process). Reduce heat to medium-low and boil gently, stirring often and reducing heat further as mixture thickens. If fig skins seem tough, use an immersion blender to break down further after 15-20 minutes. Test for setting point by doing the wrinkle test. (Take a chilled plate and add about 2 tsp of fig mixture to the plate. Place in the freezer for 2-3 minutes. Remove plate and push the mixture with either your finger or a fork. If it wrinkles, it is set). Ladle jam into sterilized jars, leaving 1/4 inch of space from the rim. Wipe off any excess jam that may have spilled. Apply lids and rings and tighten (fingertip tight). Yum so good. If you have too much feel free to send me a jar, LOL!!!! How I would love that!!!! I would enjoy us getting together!! I really would too Cynthia!!! That sounds so good. I bet the honey is wonderful with the figs! Lovely combination of flavours. Sounds delicious. Oh this sounds heavenly, I envy the lucky ones on your gift giving list! How nice, I love fig jam the honey and orange are perfect with the figs, How long will it be before you see figs on your tree? I wish I had a fig tree. We had some small figs this year that got taken by the birds. Hoping that within the next two years we have a large enough crop that we can utilize for jams. Fig jam is my favourite jam. How delicious would this be in a small shortcrust tart with a dollop of sour cream? mmmmmmm. Fig is my favorit and to add orange???? YUM! love figs jam, but this is such an unusual combination! 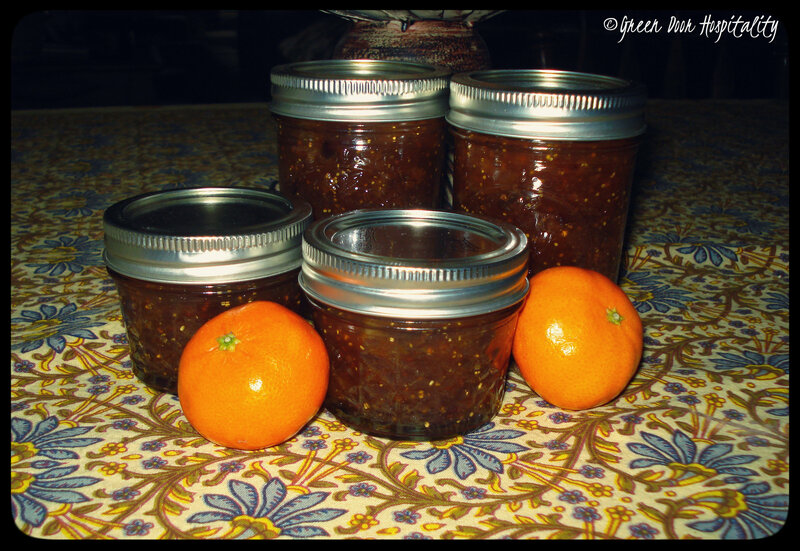 This entry was posted on October 21, 2013 by Jessica Romigh in Pantry Preserving and tagged brown turkey fig, canning, cinnamon, fig, gluten-free, ground cloves, homemade preserves, honey, jam, orange, spiced orange fig jam, star anise, vegetarian.